I absolutely enjoyed this dinner to the very last bite. I hope you feel the same way! I got this recipe from the P90X2 nutritional guide. For Salsa, combine all ingredients in a medium bowl. Cover and chill in refrigerator until ready to serve. For chicken breast, combine all ingredients in a large ziplock plastic bag. Shake to distribute well, seal, and marinate in refrigerator for at least 1 hour. Remove chicken from bag; discard marinade. Place chicken in glass baking dish. Cover with foil and place in oven for 30 to 40 minutes or until chicken is thoroughly cooked. 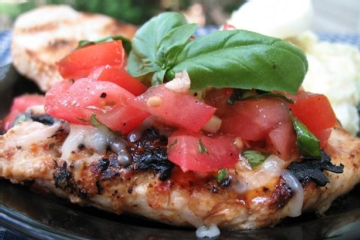 Serve with salsa on top; garnish with fresh basil leaves. I served mine with some brown rice and a fresh broccoli. My whole family and our dinner guest loved it!!! I put out some fresh mozzarella cheese for everyone else to put on their chicken but I did not! Beachbody Coach and Clean Eating MAMA!! !